Few nostalgic things can be recalled without hyperbole, but I doubt many would dispute the importance of the 16-bit JRPG. Those were the halcyon days when game stories first really meant something. Games like Chrono Trigger and Final Fantasy VI challenged our narrative expectations, while polishing a well-worn combat variant, dubbed Active Time Battle (ATB, for short). They’re considered by many to be some of the best games ever made, and not without reason. Since that era, JRPGs have been largely lacking in quality and inspiration. Level-5’s Ni no Kuni: Wrath of the White Witch manages to blend old and new, rote and unique, into something largely successful. You play as Oliver, a young boy from the stylized European town of Motorville, who is tasked with travelling to, and saving, a secondary fantasy world. He’s joined by rag-doll-come-to-life Mr. Drippy, as well as a variety of acquaintances over the course of his journey. The presence of anime titan Studio Ghibli is deeply felt, from the bittersweet coming-of-age story to the audio/visual presentation. Each character is polygonal, but animated and drawn as if they were in any number of Ghibli films, while the backgrounds and environments take on an almost Skyward Sword-like watercolor aesthetic. It’s one of the best-looking games I’ve ever played. There’s a distinct variety of locations, and a staggering amount of art on display. It really nails the sense of adventure that comes from most great entries in this genre, as Oliver treks his way from the lush forests of Ding Dong Dell to the arid deserts of Al Mamoon. The score, composed by Ghibli veteran Joe Hisaishi, and performed entirely by the Tokyo Philharmonic Orchestra, is grand and memorable in precisely the ways a JRPG soundtrack should be. While Ni no Kuni is outwardly warm and friendly, many of its gameplay machinations are quite sophisticated and brutal. So much so that the game doesn’t really open up everything it has to offer until the 10-hour mark. The slow build is necessary and appreciated, but it’s indicative of the sheer wealth of content, and the complexity that lies within. Battles are in psuedo-real time, where surface-level menu selection proceeds without pause, but time freezes when you go a bit deeper to select any sort of spell or consumable. You also can train and acquire familiars, who each have their own unique stats, abilities, and weaknesses. The constant switching between party members and familiars in real time feels like an odd hybrid of Final Fantasy XII and Pokémon. It’s a rather flimsy system that works around 70 percent of the time. The main flaw that’s exposed after playing a difficult fight is the way the battle system handles AI. Controlling Oliver and his familiars is generally an exciting and strategic affair, but it’s brought down by everyone around him. The two other party members have familiars of their own, and can be controlled at any time. But switching between members is cumbersome and slow, making any sort of on-the-fly tactics simply unfeasible in a faster-paced battle. You can give them vague instructions through a tactics menu, or by telling them to enter an “All-Out Attack” or “All-Out Defense” mode, but their unreliable intelligence makes the interaction an exercise in endless frustration. The combat also, in a strange turn of events, isn’t versatile enough to handle difficult normal encounters. The boss battles are uniformly excellent, mainly due to their predictable and slower pace. Even if I was under-leveled, a smart use of familiars, items, and spells would land me victorious in these fights. The normal encounters move at an unmanageable pace, revealing just how little it takes to make the combat fall apart. If you don’t have the high-level brute force to make it through those fights, you’ll have to avoid them. Simple as that. And avoid them I did. It led to an incredibly puzzling last third of the game, where I’d be decimated by most every normal encounter, but I’d always have a good chance at taking out that dungeon’s boss. I can’t lie and say I didn’t have fun doing this (the boss battles, as I said previously, are truly great), but it’s such an odd and broken aspect of this game that it bears mentioning. The combat comes within spitting distance of great, and when it works, it’s enthralling. But due to these problems, as well as a variety of infuriating difficulty spikes, I’d honestly recommend playing the game on the easier difficulty. A criticism like that would sink most games, let alone JRPGs, but I still adore Ni no Kuni. I fully admit that it’s a game designed to directly tickle the pleasure centers of my brain’s nostalgia, but it carves out something unique in terms of tone and look. It’s a charming game, and one that nicely replicates rhythms I’ve come to expect from this genre while simultaneously dazzling me with it’s inventiveness and creativity. It’s another one of those games, yes, but it tries so damn hard to be a good one of those games. One of the best, unique elements of the game is the way magic is used for environmental puzzle-solving. Most of the spells Oliver learns aren’t used in battle. Instead, they resolve conflicts outside of dungeons. Using certain spells can result in everything from rejuvenating a dying tree to building a bridge over a wide gap. The feeling of magic being a part of the world is solidified by these segments, which are largely extremely charming. 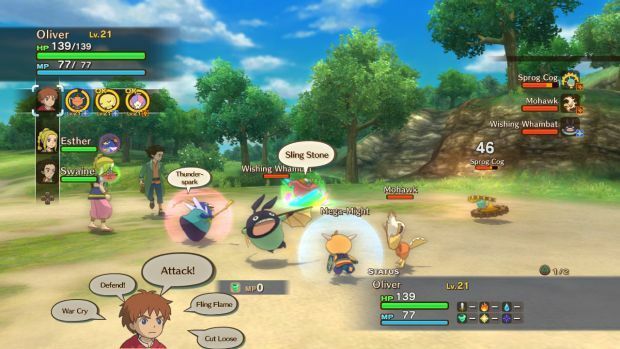 That’s not all Ni no Kuni has to offer in the way of non-combat activities. Example: a major antagonist named Shadar has been going around breaking people’s hearts. Essentially, this means that you’ll happen upon a person who may be lacking in a certain trait: enthusiasm, love, courage, etc. To fully mend that person’s heart, you need to find another person who is overflowing in the same trait, and borrow some. These segments are ultimately fetch quests, but the mark of a good fetch quest has always been presentation, and Ni no Kuni knocks that aspect out of the park. There’s a ton more packed in here, including errands you can run for townspeople and bounties you can cash in for equipment and gold. Everything is neatly categorized in a journal as well, making a completionist’s job that much easier. I’d imagine you could sink anywhere from 60-90 hours tying up those loose ends; I spent 40 on mostly story content with some sidequests sprinkled in. The game also let’s you jump back into the world after watching the credits roll, so don’t hesitate to finish up the story first. My relationship with this genre has been well-documented in other places on this site, but it bears repeating: this is a JRPG in a classical sense, and if that’s sounds unappealing to you, it isn’t worth your time. Studio Ghibli’s writing and visual presentation are absolutely stellar, but they’re not overwhelming enough to carry someone through a game they won’t enjoy. Ever since Final Fantasy VII, JRPGs have become a rather different beast. Fantasy worlds of yore became replaced by a wealth of futuristic steam-punk locales, and the constant refinement of the ATB system has led to some combat designs (I’m looking at you, Final Fantasy XIII and XIII-2), where player agency and engagement is close to non-existent. 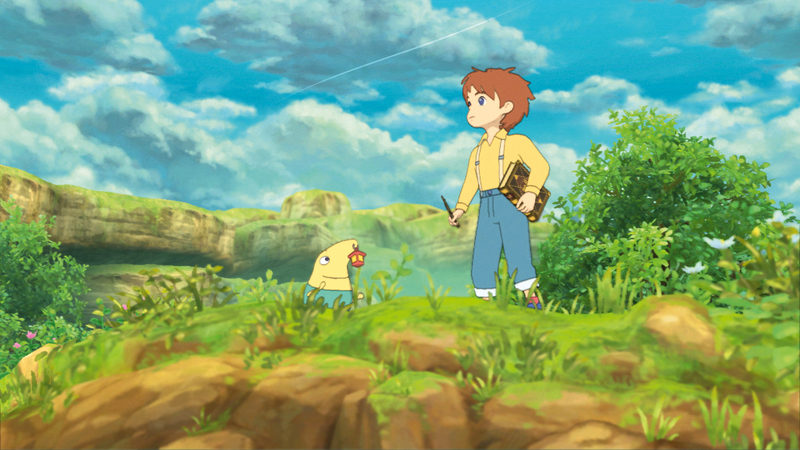 Ni no Kuni is ripped wholesale from a different era, one that modern players may find shockingly refreshing and earnest. This is the kind of game I really wish more people were making. Maybe that’s just me, and maybe everyone else outside of my bubble agrees that JRPGs are headed in the right direction. But from my perspective, I don’t have to think twice about calling Ni no Kuni: Wrath of the White Witch the best game of its kind on this generation of consoles. Not to sound too curmudgeonly, but, well, that kind of declaration used to mean something. ddue to this sensible paragraph.